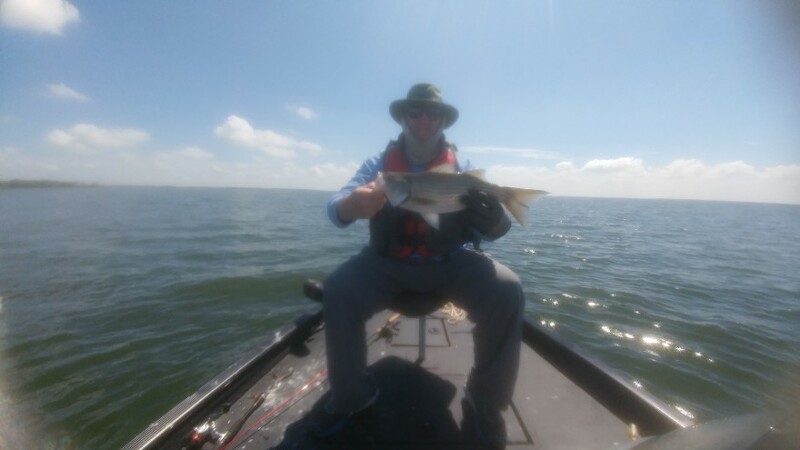 Went on a teaching trip at Lake Tawakoni with TFFer Lollygagger(Brad) yesterday. We launched at 8AM and stopped fishing at 5:15PM with a total of 240 fish caught. It was a perfect day weather-wise and catching-wise to help someone learn how to find fish and to catch them using the Mepps technique. We started at Finger Point, marked fish there, but they moved immediately. After I found them again using the big motor, the iPilot remote wouldn’t let me spotlock – it was flashing like crazy – maybe because it got sat on or maybe needs new battery. Luckily, I brought an anchor – the bell type, which won’t hold in windy weather. With a brisk wind coming from the east, we couldn’t stay on Finger and hold anchor, so we headed to the east side to Greenville Pump Station. That was providential because we found tons of big whites there and sat in one spot and caught 150. 95% of the whites were between 14.5 and 16 inches – what a blast. 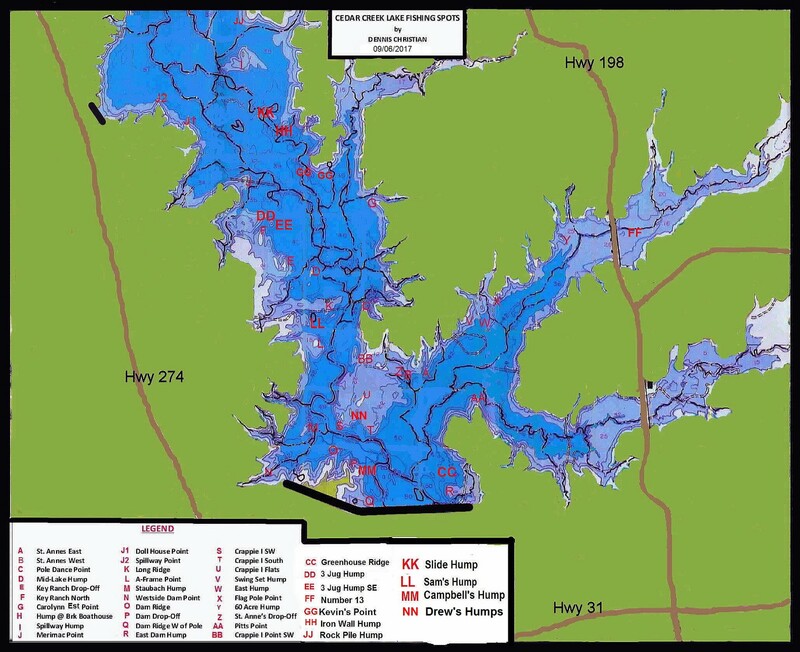 We could have stayed there and continued to haul in the fish, but I wanted to show Brad some other Tawak spots. So, about 12;30 we went to Cloud Point and ran into etu and lenahorse with Rex and Charlie fishing with them. We marked fish close to them and caught another 16 while they left to check out some bird action not far away. When it slowed we moved on south to the southern-most point of the Cloud Point area. 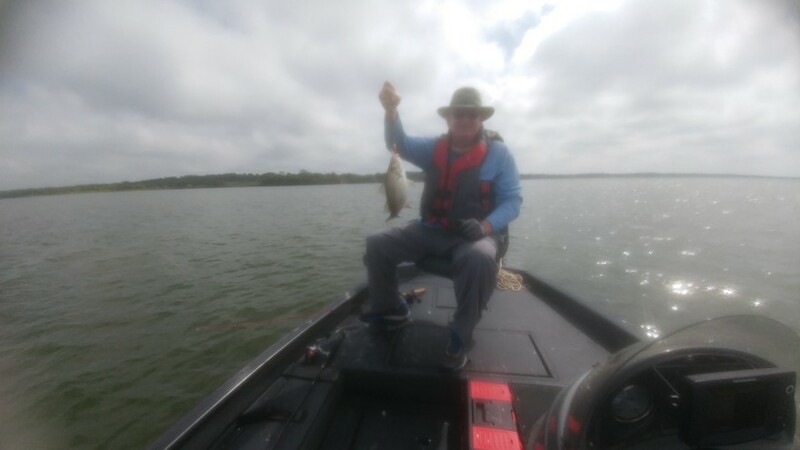 Found fish and left there after getting white bass count to 175 - still catching big ones here as well as at the rest of the spots we fished. Next stop Sun Point. Found another big bunch there and left when we got to 200 whites. Continuing south we stopped at the point just south of Cedar Creek and found more fish. Left there when count got to 215 and went south to what I call Tripod Hump. Found fish on the west finger of it and caught another 15 whites to bring our total to 230. We also caught 3 legal hybrids, 2 short hybrids, 4 cats and a big yellow bass. During the day Brad kept getting better at catching fish on both Mepps 2’s and 4’s. Which did the fish like best? It varied from structure to structure. At Greenville Pump Station they took 2’s and 4’s equally readily. At all the other spots except Tripod Hump they wanted a #2. At Tripod #4 worked best. Pics below (Sorry about my camera's fuzziness). Last edited by Dennis Christian; 09/22/18 01:05 PM. I can truly say that I had a blast! 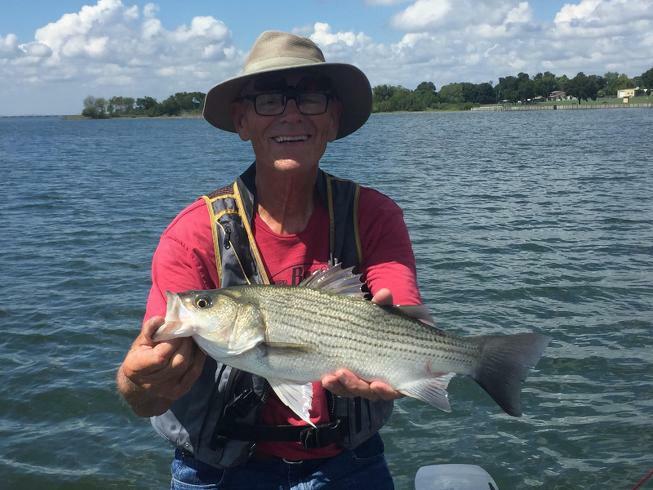 Not only because of the education on finding white bass and catching them using the Mepps technique, but more than that, but because I got to spend the day in fellowship with a new friend and a brother in Christ! The Lord has indeed enriched my life with the time I spent with you, Dennis! Thank you again for such a great time! Let me know if it's not the just the battery on the iPilot remote and I'll replace your remote. Don't forget if you have a smart phone you can download the minn-kota app and it will "spotlock" for you if your remote is acting up. It will not stow or deploy but at least the anchor mode will function using your smart phone. Wow, I didn't know that. I'll search for the app, but in case I have trouble finding it, what is it called? Well, I searched and it looks like it only works for 2017 or later models. Mine is a 2012 model Terrova. Heading out in the morning. Anyone else? Taking son in Champ for first time. He has loaded and unloaded the Ranger but the Champ is a different animal on the ramp. It is about time he learns how to drive it. I will be there early if it’s not raining. It is just called "I Pilot". Not sure what else to tell you. You may find it on your "play store" on your phone if it is an android. Oops, sorry Dennis just caught your last response. Never mind, mine is a 2017. Last edited by JWC Nauticstar; 09/15/18 03:19 AM. Well I finally broke down and bought a cast net and now I need to find a place to use at Tawakoni. Any of you guys net and where's a good place to start. Thanks for any help. Guess I don't need yall's help after all. Found'em on my own. Sorry Aggie, I lure fish only. Me too but the first time ever thought I'd try live bait since I was gonna try striper fishing. Caught 3 bass back in Rabbit and stopped on the way out and on my second try with a cast net loaded up on 3-4" thread fin shad. Unfortunately I couldn't find any stripers and had to throw all the bait back. I think bass are easier to find than stripers but decided to try something different. Still, it was fun throwing a cast net for the first time. Wish I had caught something with'em.